Ginger-infused vodka pairs deliciously with grapefruit juice, lime juice and fresh cranberries in this sweet and tart Fruit & Gingerly cocktail. All photography courtesy SKYY Vodka. CAPSULE REPORT: A versatile ingredient featured in everything from cocktails to candy to main courses and baked goods, ginger is an age-old flavor that has become the recent darling of the mixology and culinary world. We’ve tried a few ginger-infused vodkas, including SKYY Vodka’s seventh addition to its SKYY Infusions line (joining Cherry, Citrus, Grape, Passion Fruit, Pineapple and Raspberry). Infused with fresh ginger, this spirit is sweet, with an aroma of citrus, hints of clove, candied ginger and baked spices. 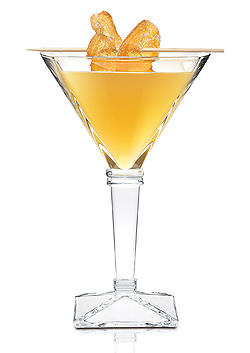 Here, we present 10 sophisticated cocktail recipes from SKYY’s contributing mixologists that utilize ginger vodka and some unexpected partners. Carrot juice, lychee purée and capers, anyone? This is Page 1 of a three-page article. Click on the black links below to view the other recipes. Ginger is one of the seven “super spices” (along with cinnamon, oregano, red chile pepper, rosemary, thyme and yellow curry) that have been shown to have curative effects on everything from Alzheimer’s disease to cancer. This flavorful citrus cocktail is sweet and refreshing. Created by Adam Wilson of Beretta San Francisco. *Combine .25 ounce honey and .25 ounce water. Add rest of ingredients with ice and shake vigorously. Strain into cocktail glass and garnish with candied ginger. Another fruit juice-based libation, the tartness of this citrus and cranberry cocktail is tempered with the sweetness of ginger and fresh pineapple. Created by Adam Wilson of Beretta San Francisco. 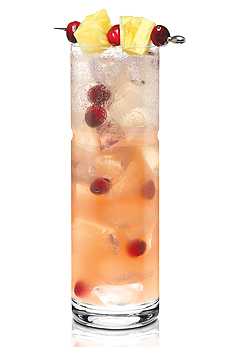 Muddle cranberries and pineapple in a cocktail shaker. Add ice and rest of ingredients except soda and shake vigorously. Pour into a Collins glass with fresh ice and top with soda. Garnish with additional chunks of pineapple and/or cranberries on a toothpick laid horizontally over rim of the glass. Thanks to the fresh carrot and orange juice in this recipe, you get nearly 175% of your daily recommended vitamin A and nearly 50% of your daily recommended vitamin C. But we’ll stop short of declaring this cocktail a health food! Created by Alex Straus of Suite 700 at the Hotel Shangri-La in Los Angeles. Combine all ingredients except rosemary in a cocktail shaker with ice. Shake vigorously and strain over fresh ice into a rocks glass. 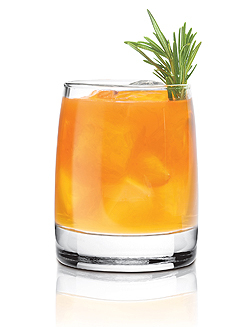 For garnish, gently press the sprig of rosemary to release oils and place vertically in the glass.